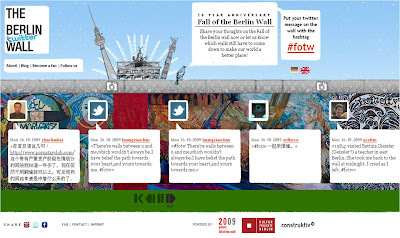 The Berlin Twitter Wall is a simple but effective way of personalising the celebrations and taking the main event online / to a global audience - though after encouraging comment about 'walls that need to come down' there is now a difficult decision about whether to moderate anti-Chinese government internet protests. Censoring activity that celebrates freedom doesn't feel right, but having an official German celebration 'hijacked' by internet users protesting about freedom in China is probably not ideal either. A great project, but some difficult decisions to take - what to do?